Howdy, forex friends! We will be getting Canada retail sales and CPI reports tomorrow at 12:30 pm GMT. These are top-tier economic reports, so there’s a very good chance that the Loonie may get a volatility infusion that will allow us to pillage some quick pips from the Loonie before the week ends. However, since the BOC statement is coming up next week, there’s also a good chance that we’ll be seeing some follow-through buying or selling. And if you need to get up to speed on what happened last time, as well as what’s expected this time around, then you better gear up by reading up on today’s write-up. Canada’s August CPI report revealed that headline CPI fell by 0.1% month-on-month. The decline is within expectations, however, so it wasn’t too disappointing. Year-on-year, headline CPI eased from +3.0%, which is the best reading since September 2011, to +2.8%. This is not too bad since the weaker reading was within expectations and is still the second best reading since September 2011. A closer look at the details of the CPI report showed that only 3 of the 8 CPI components printed weaker increases on a year-on-year basis. And of those 3, weaker increases in food prices and transportation costs were the main culprits for the weaker annual reading. Moreover, 4 of the CPI components printed stronger increases, which is why all of the BOC’s three preferred measures for the core reading showed improvement. As for specifics, the Weighted Median CPI increased from +2.0% to a four-month high of +2.1%. The Common Component CPI, meanwhile, accelerated from +1.9% to +2.0%. As for the Trimmed Mean CPI, that improved from +2.1% to +2.2%. In summary, the August CPI report looked disappointing on the surface. However, the readings were within expectations, so they weren’t really that disappointing. More importantly for rate hike expectations, all three of the BOC’s preferred measures for core inflation were able to tick higher, so the CPI report was actually positive overall. For the inflation situation in September, economists forecast that headline CPI fell was flat month-on-month after falling by 0.1% previously. The prices index of the Ivey PMI report slumped from 71.5 to 68.8 in August, which means that input costs increased at much slower rate. The monthly reading has historically been stronger in September (more often than not), which is in-line with consensus. Looking at how economists fared with their guesstimates, they have had a mixed record, so there are no apparent historical tendencies. However, it’s worth noting that economists have been too optimistic in recent years. In fact, since there already three consecutive downside surprises. To summarize, there’s a consensus that CPI was flat month-on-month in September after falling by 0.1% previously. The leading indicators point to weaker input price inflation, though, which goes against consensus. As for historical trends, comparing the readings for August and September show that September usually prints better readings, which supports the consensus view. However, economists have a tendency to overshoot their guesstimates in recent years, resulting in more downside surprises. And that skews probability slightly more towards a possible downside surprise for the monthly CPI reading. Retail sales in Canada increased by 0.3% back in July, which is within expectations. However, the previous reading was upgraded from a 0.2% contraction to a slightly weaker 0.1% contraction. The core reading, meanwhile, surprised to the upside by printing a 0.9% increase, soundly beating expectations of a 0.6% rise. Moreover, the previous reading was revised from a 0.1% downtick to a 0.1% uptick, which is also good news. And according to the details of the report, motor vehicle and parts dealers reported a 1.4% month-on-month slump in sales. However, 7 of the 11 retail store types reported stronger sales, which is why the headline reading was able to match the previous headline, and is also the reason why the core reading surprised to the upside. In short, the July retail sales report was pretty good overall. The details of the report, in particular, even showed that growth in retail sales was broad-based. For this Friday’s retail sales report, most economist forecast that total retail sales will match the previous month’s pace by printing a 0.3% month-on-month increase. The core reading, meanwhile, is expected to come in at +0.1%, which is much weaker compared to the 0.9% increase recorded during the previous month. There’s therefore an implied consensus that non-vehicle sales deteriorated and that vehicle sales will drive retail sales growth. After all, vehicle sales are excluded from the core reading. Canada’s August jobs report showed that the wholesale and retail trade industries shed 19.6K jobs, which may be a sign that business conditions weren’t too good back in August. Canada’s August trade report revealed that imports of motor vehicles and parts fell by 3.84% (-1.17% previous). However, the trade report also showed that imports of consumer goods slumped by 3.71% (+0.32% previous). Well, both the headline and core readings have been printing weaker August readings in the last 5 years. And that’s in-line with the consensus that the core reading weakened. As to how economists fared with their guesstimates, they have an inconsistent track record when it comes to the core reading. However, they have a historical tendency to be too pessimistic and undershoot their forecasts for the headline reading, resulting in more upside surprises. However, there have been more downside surprises for both the headline and core readings in recent years. To summarize, the leading and related indicators and reports are pointing to the possibility that retail sales weakened in August, which is in-line with the consensus that the core reading weakened. However, Canada’s trade report also showed that imports of vehicles slumped, which goes against the implied consensus that vehicle sales made up for the slump in non-vehicle sales, given that the headline reading is expected to match the previous month’s rate of increase. Historical tendencies support the consensus view for a weaker core reading. However, a look at how economists fared with their guesstimates show that economists appear to have a tendency to overshoot their guesstimates, especially in recent years, since there are more downside surprises for both the core and headline readings in the last five years. And that skews probability more towards a possible downside surprise for both the headline and core retail sales readings. But again, just keep in mind that we’re playing with probabilities here, so there is always a possibility that both headline and core readings may surprise to the upside. Like last time, Canada’s retail sales and CPI reports will be released simultaneously. So if both top-tier reports beat expectations, then that would likely reinforce rate hike expectations and propel the Loonie higher, especially with the BOC statement coming up next week. On the flip side, a miss for both top-tier reports will likely send the Loonie lower. 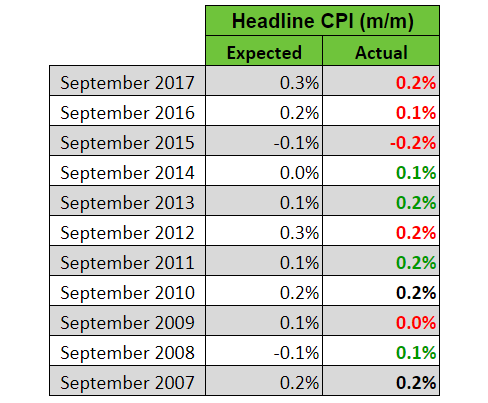 And if the readings are mixed, then the CPI report usually takes precedence, with the headline month-on-month reading usually in focus since it’s tied more directly to BOC rate hike expectations. Last month, the Loonie’s CPI readings were within expectations, so forex traders took directional cues from the better-than-expected core retail sales reading. Anyhow, NAFTA has been pushed into the background lately since Canada and the U.S. have successfully struck a deal. Also, NAFTA will be renamed to the “United States-Mexico-Canada Agreement” or USMCA for short. The Loonie has therefore reverted to taking directional cues from oil. You may therefore also want to keep an eye on oil prices. And if you didn’t know, you can check out oil prices at our Live Market Rates page.